With Destiny 2 hitting PC today, we're taking a look back at the Shacknews review, along with some reviews from top critics, to see how Bungie's sequel has fared across all platforms. Destiny 2 has been available for nearly two months on consoles, but PC players are getting the chance to discover Bungie's sequel for the first time today. So for this edition of Final Score, we're going to do something slightly different and hopefully help the readers out a little bit more. In addition to looking back at the Shacknews review, we're also going to take the opinions of some of the best gaming critics from around the web. But we're also going to separate things by platform to see if any of these opinions differ significantly. Let's take a look at Destiny 2 and see whether the Traveler's Light shines on this sequel. The campaign is enjoyable while it lasts, thanks mostly to smart single-player AI (which becomes noticeably dumber in multiplayer), a truly epic soundtrack, and great voice acting performances. Nathan Fillion, in particular, is a hoot as Cayde-6. But with so many different elements of the game that open up after the campaign, there's so much to do and something truly for everyone. Even the 4v4 PvP modes in the Crucible are a fun diversion, with varied playlists and some brilliant map design. Polygon 9/10 (PlayStation 4): As an overall product, Destiny 2 is an incredible feat. Bungie spent three years essentially beta-testing this game, and used the knowledge gained from its predecessor to improve and fine-tune just about every aspect of the experience. As with the original, there are still rough patches to pave over, but the astoundingly fun game here is beautiful, funny, varied and constantly rewarding to play. The first Destiny was a game that we played and enjoyed often in spite of itself; with Destiny 2, Bungie has crafted something that’s genuinely worth the time, especially if you’ve got a few dedicated friends willing to join you. PlayStation Universe 9/10 (PlayStation 4): Bungie's pedigree speaks for itself when it comes to nailing the satisfying shooting mechanics, and the cooperative nature of the game and varied mission structure oozed potential. Sadly, it took nearly two years' worth of expansion to really deliver the game we were promised back in 2014, and that’s where Destiny 2 has managed to step up to the plate. It's clear that Bungie’s design philosophy for its science-fiction shooter is to polish rather than evolve the brand, and that's not necessarily a bad thing. Like Destiny 1, the core gameplay experience is bifurcated by PvE and PvP activities, though both areas come equipped with more than their fair share of improvements. TrueAchievements 4.5/5 (Xbox One): Destiny 2 takes the groundwork set out by its predecessor and refines some of its rough edges, especially in terms of its plot. Bungie hasn't changed the fundamentals of the game but has made it feel a lot more accessible to new players. They've increasing the number of activities there are for players, although the grind does eventually set in. That said, it doesn't quite feel like a sequel. There isn't much in the way of brand new content — a lot of what has been added is the same as before but just repackaged in some way. The title does still have plenty of room to grow and if its life cycle is anything like that of the original Destiny, the game may look and feel different in two years time. With two expansions already on the horizon, we may even see a few changes in the very near future. PCGamesN 7/10 (PC): I make a lot of comparisons to the first Destiny in this review. The sequel is a better game in nearly every way, but to be honest, the soft light of that context should not mean much to you, a PC gamer, who did not have to suffer the original’s mistakes. 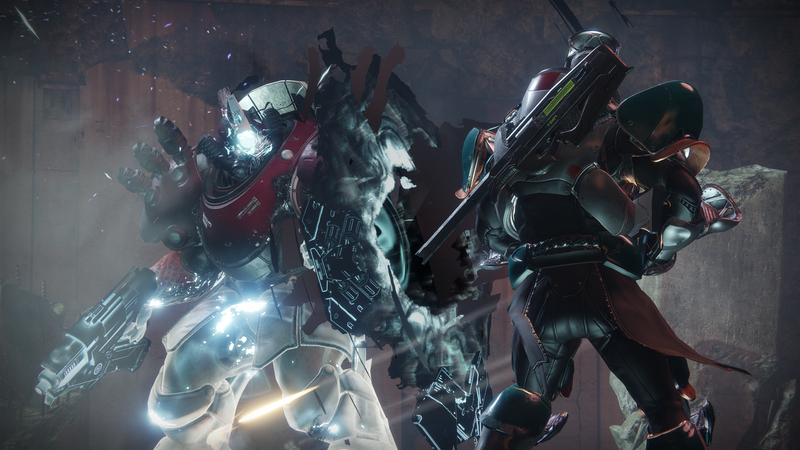 Yes, Destiny has a story now, and an in-game map. It is far more readable, and the painful loading screens that bisected every activity are gone. Having put 600 hours into the first, I am glad of these changes, but why should they impress you? They should not. They are what you should expect. Instead, it is impressive that Destiny 2 looks, sounds, and feels better than anything on the market, especially on PC. It is capable of occasional, untainted brilliance: the Souls-esque release of beating a Nightfall boss or clearing the raid; pulling off a thrilling clutch in the Crucible; that rare moment in the campaign when sight and sound synchronise just so; or when the camera rests on a scene so gorgeous you have to turn off the HUD and take a screengrab. However, aesthetic brilliance and great gunplay can’t wholly save Destiny 2’s campaign from trivial difficulty, repetitive action, and a go-nowhere plot. Its best content in the mid-game and beyond is betrayed by a reward economy that nudges you instead toward a vacuous treadmill made of public events, and which truncates the endgame. Mindlessness abounds. Some of it is by design, while some is, hopefully, accidental, and may be fixed in the future. What's been your experience with Destiny 2, regardless of your platform choice? Do you agree with the critics or do you have a different opinion? Join the conversation and let us know in the comments. And if you need a hand, check out our walkthrough and guide.